It's more than just a blueprint. OOP. Object-orientated-programming. Something that every programmer should be able to do nowadays writing a 3rd gen language. With dynamic languages, I’m not entirely sure on how different it is, but I’m guessing the principles are the same. But that’s not what I’m here to blog about. I’ve managed to whip up a demo of the toolkit, OOP, or I’d like to call it, Object-Orientated-Paint. So for those that use Microsoft Paint (and I still do), many will know how annoying it is to only have one canvas, and that every single dash or pixel “painted” on to the canvas is essentially there to stay unless another splash of paint writes over it. It’s quite frustrating, especially when only a few minutes down the line do you realise that you forgot to draw something and therefore have to edit the whole picture. Once you’ve edited that picture, you’ve also no way of going back either (the undo command only has a history of 3, something that has frustrated me rather a lot over the years). So why better it by encapsulating each shape/splash of paint as an object? It’s essentially what Microsoft Powerpoint uses. True, you dont’ get the same precision and granularity to edit a particular shape as you would in Paint, but it’s a heck of a lot easier to use. Although my knowledge is very limited in the area, I’m guessing you could make the same connection with C and C#. C is a language (correct me if I’m wrong here) that is not designed for OOP, yet it allows you to reach the gutsy insides of a computer. C# on the other-hand is designed to be used in OOP, and although it’s a lot harder to get to the lower-levels of computation, it is a lot faster, and ultimately easier to use. Now jumping the gun a bit, it’s similar to Renderer and the toolkit. Renderer is just a wrapper around OpenGl – it can do everything it wants, providing OpenGl supports it (although I haven’t wrapped around every single OpenGl call – that would be insane). Yet if I were to use Renderer indirectly, via the toolkit, I am unable to do everything that Renderer supports – the toolkit limits my actions, yet makes the more commonly used functions of Renderer a lot easier to deal with. Enough rambling. I’ve implemented basic shapes in the toolkit, as well as very basic shape control. Shapes. Using the toolkit, I am able to ask for basic shapes. Each shape has a fill colour, line colour and line width property. Shapes Select. I’ve also added picking functionality and shape control too. When a user selects a fill/border of a shape, it will recognise it as a shape. This is then decorated with a shape control. This shape control has handles – these too are shapes. Shapes Resize. Clicking on a handle requires a couple of steps first before allowing to interact with it. Although clicking on a border/fill will return the shape representing the handle, the handles act differently and need to be tested for. Once this is done, we can notify the application that a handle is selected, not a shape. This is important because if it was a shape, then the shape control will try to decorate the handle – clearly something that needs to be avoided. Shapes Move. clicking on a shape not only decorates it with a shape control, but it also allows you to drag and drop the shape too. Before this demo, I’ve had a lot of trouble creating similar objects. I’ve created bézier curves for the toolkit too, but I haven’t shown them because I ‘ve never been to happy with them. If you recall from DrawCurve(Bézier);, near the end I was able to draw a master curve, encapsulating the bézier sub-curves. To incorporate this into a scene graph, I needed an anchor, a node. I did this by using a get property for the root of the curve. The problem with this is that once the Rootnode of the bézier curve is accessed, anything can be done with it. A renderable can be assigned, all the children cleared, random children added. It wasn’t very safe, and I never really did like it. Why I never thought of simply inheriting from a model node in the first place, I’ll never know. Not only does it allow me to change the node contents a lot easier, but it also means that I can change the interface, so that only a few select items can be modified. The only problem is that I have to cast from an IShape to an INode for when I want to add it to a graph, but at least the internals are protected from modification. I suppose you could say someone could take an IShape and cast it into an INode and use it from there. I guess there’s no stopping that. Regardless, I’m finding it a lot easier to use the latter method than the former. It took me only a week to create the shapes demo, but around two to get the bézier curves in the toolkit working. Has anyone seen the statue designed for London 2012? I thought I’d try and recreate it. And if you ask me, I can’t say I’m particularly fond of it either. Kapoor 2012. 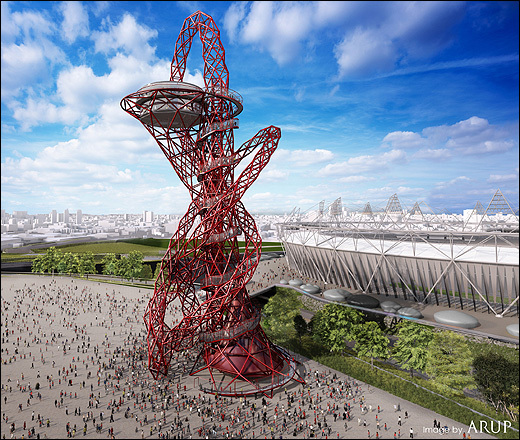 Winning design for the London 2012 statue. Apparently, it’s designed to stay. No thanks. OOP Kapoor 2012. It might as well look like this. As a side note, a couple of guys have released a rather nifty free tool, Paint.NET. It’s a lightweight application that’s pretty much paint, but similar in the style and functionalities of Adobe Photoshop. So those who can’t afford the extortionate prices of designer tools, well, I’d highly recommend giving it a try. Did I also mention it’s free?